What’s It About? : 1892 and the Johnson County War is rapidly growing in the state of Wyoming. Harvard graduate James Averil (Kris Kristofferson) returns to his home town to find tensions growing and divisions appearing in the local community. The government-backed cattle barons are raging a war on the immigrant settlers, and have drawn up a ‘death list’ for hired mercenaries to act upon. A full-blown, bloody war edges closer. Verdict: The epic film that brought down an entire film studio finally receives the director’s cut that people have been crying out for. Running at over two hundred minutes in length, this is every bit as epic a film as ever will be made. Its cinematography blows you away the moment it starts and for the remaining three plus hours it revels in its audaciously beautiful shots of the dusty barrens or wide landscape ranges. At times its breathless golden hue makes everything feel like the sun setting on a wonderful day. But looking good is not enough for a film, it needs the viewer to invest in the characters and their beliefs. Sadly none of these make us care too much about them and they all become forgettable as we have to wait far too long before returning to see them in the next part in the journey. Kristofferson and Walken are perfectly amiable yet never deliver a consistently energetic performance; it’s not until the third hour that we really see these two guys go to work on their respective impetuses. The long, dramatic unfolding of the story wastes huge amounts of time on nothing remotely interesting, it slowly moves between one sketchy plot to another vague plot point. Never moving beyond a snail’s pace the film drowns in pretentious wastefulness. 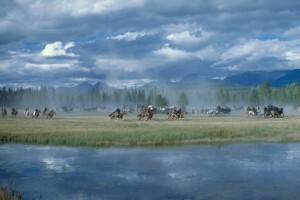 Director Michael Cimino appears to have been unsure about the story, adding everything and hoping some of it would work. It’s three and a half hours of misguided attempts at telling a non-complex, but brutal storyline. Extras: A new interview with Jeff Bridges, in which he talks about the role and how he got to keep the hog ranch in the film. Also included is a new interview with legendary cinematographer Viloms Zsigmond, how he gave the film its wonderful look and dealing with the action scenes. The final extra is the best part of the package, an hour long version of the documentary ‘Final Cut: The making and unmaking of Heaven’s Gate’ based on the superb book by Steven Bach. Nearly everything you could want to know about this infamous film is included here. This is one of the finest documentaries about a single film, and ranks up there with Hearts Of Darkness. Final Word: Heaven’s Gate finally gets the long cut the director always wished for, alongside a clean up on the audio and visual. But even this can’t stop it from being an overtly wasteful film for many of the scenes. There is an interesting film in there, but wading through nearly four hours of it to find those moments is a bit of a chore with flashes of brilliance. 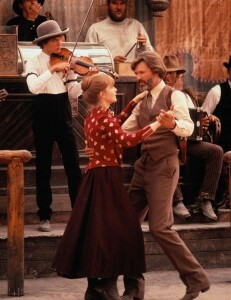 The restored version of Heaven’s Gate is out on Blu-ray and DVD on 25 November 2013.